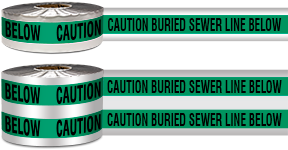 Manufactured for identification and early warning of underground utilities lines. 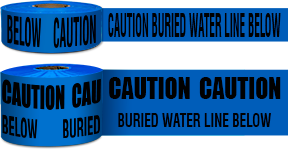 Acid and alkali resistant polyethylene warning tape is constructed of a 4.5 mil solid aluminum foil core with an imprinted warning legend that is completely encased to prevent ink rub-off. Highly reflective foil surface is visible from both sides of tape to flash its warning to excavators. Tape is supplied in 1000' coils with widths going from 2'' to 6'' wide. 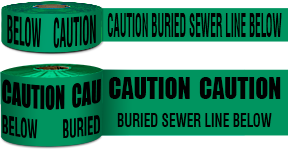 Tape contains the printed identification of the Utility Line buried below it and it conforms with APWA color code specifications for underground tape systems. 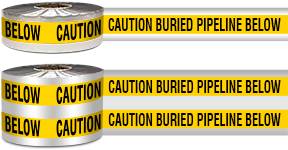 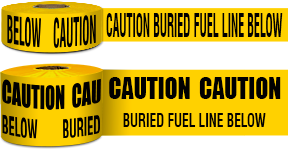 Non-Detectable warning tape for the protection, location and identification of underground utilities. 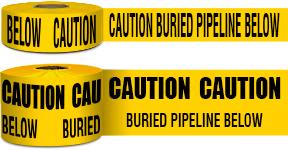 Consists of a nominal 4 mil overall thickness, inert 100% low-density acid and alkali resistant polyethylene plastic film, formulated for extended use underground. 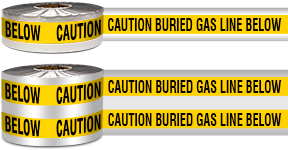 Used to bury the tape above electrical lines, gas pipes, communication cables and other utility installations. This product is lead-free.